David Tennant and Matt Smith attended Wizard World New York Fan Convention on Saturday 16th April. The convention was open from 10am to 7pm and was at the PlayStation Theater in Manhattan. This convention was called Two Doctors as it only featured David and Matt. The day included a dual Question And Answer panel, photo ops (both single and together) and autographs sessions. The Dual Platinum VIP Package cost $850 and included the Question And Answer panel, autographs and photo ops with both David and Matt. David Tennant Gold Package cost $450 and included autographs and photo ops with David. 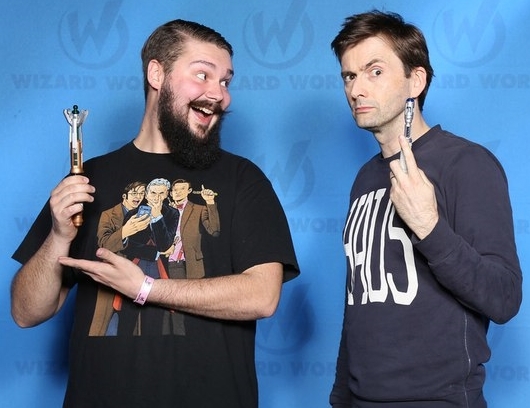 David Tennant Preferred Package cost $150 and included an exclusive David Tennant lithograph and photo ops. Link to posts related to David Tennant at Wizard World New York Fan Convention on Blogger.com (usually with more details). Today David Tennant and Matt Smith attend Wizard World New York Fan Convention.